South Korea is one of those countries that tries to be nothing other than South Korea. That is exactly what makes it such an appealing destination. Sure you may find some foreign brands and outlets, but based on the minute level of spoken English in the country and the truly homogenous appearance of the locals it is extremely unique when compared to countries in the South East Asian region. From the second I stepped out of Incheon Airport en route to my hotel it was clear that the transportation industry was extremely organized. Buses were on time and the massive MRT network in Seoul ran seamlessly throughout the vast city region. Despite this organization, getting around was quite challenging due to the lack of English proficiency in the country, but locals did randomly approach me in order to help direct me towards my next hotel. 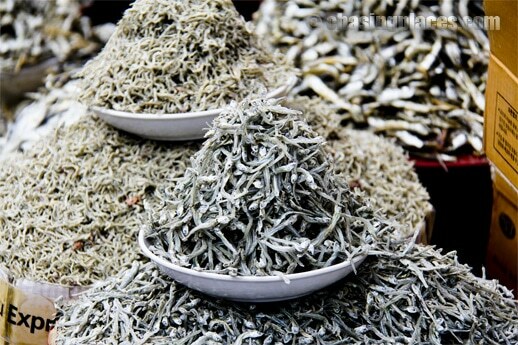 Two of those destinations turned out to be arguably the best seafood markets I have ever seen throughout my travels. 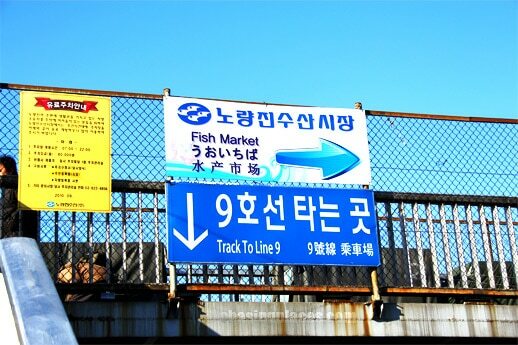 The markets I am referring to are the Noryangin Fish Market in Seoul and the Jagalchi Fish Market in Busan. After jumping off of the MRT I didn’t need to ask any locals for directions. The combination of the smell and the proximity of the market enabled me to find it within a couple of minutes. When I first entered I could see a massive sprawl of water tanks containing everything from sea cucumbers to black eels. 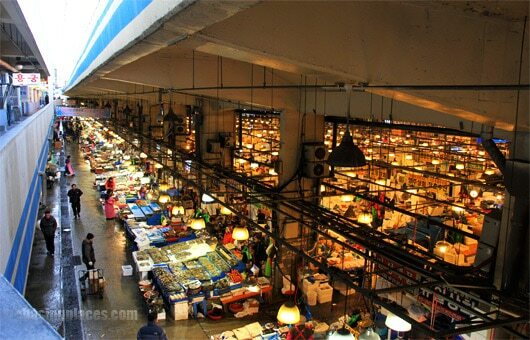 According to the locals the market can get quite busy, so I was fortunate enough to have arrived when it was practically empty. As I roamed throughout the 700 small vendors I felt overwhelmed by the variety of species available for purchase. Since most of the locals at the market could not speak any English, I quietly wandered around and watched them clean their tanks and distribute stock. Many of the fish were quite large, so I would recommend booking a hotel not too far away and heading to the Noryangin Fish Market with a few travel buddies and sampling some of the fresh catch at one of the nearby restaurants. Where did I stay in Seoul? During this trip to Seoul I decided to stay at Kaya Hotel. I found the rooms to be very clean at this property and it was convenient to access Seoul’s attractions from here. At the time of writing, it had a score of 7.2/10 based on 319 verified guest reviews. It is important to note that we don’t have a direct affiliation with this property. 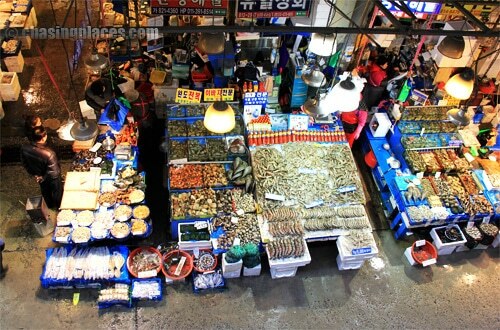 The Jagalchi Fish Market in Busan had a completely different vibe than Noryangin. 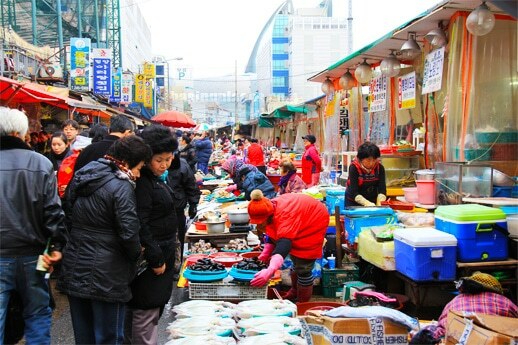 The market consists of some covered buildings with seafood for sale, but I preferred the street market section myself. Strategically located near the docking area of the largest port in the country, Jagalchi was full of energy with a dense flow of locals sampling the exotic seafood on display. During all of my travels I have never seen so many people eating live eels. 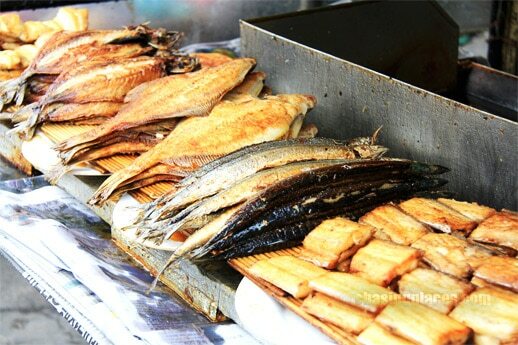 After an order for an eel is placed, a local cook would grab one out of a bucket and as it continued to squirm they would place it directly into a fire-hot grill. I didn’t let this ruin my appetite though. I walked through this massive street market and dipped into a nice little seafood restaurant and enjoyed their highly recommended octopus soup. I asked them to hold off on the eel. Where did I stay in Busan? During this trip to Busan I decided to stay at Elysee Hotel Busan. I found my room here to be affordable, clean and the property is in a convenient spot (especially if you want to check out the fish market). At the time of writing it had a score of 8.1/10 based on 1266 verified guest reviews. It is important for you to know that we don’t have a direct affiliation with this specific property. How to find the cheapest rooms in Busan and Seoul? Agoda.com : This is one of the largest room providers in South Korea with many verified guest reviews. Very insightful article. Well done!